Buy this and make me rich, famous and universally loved! 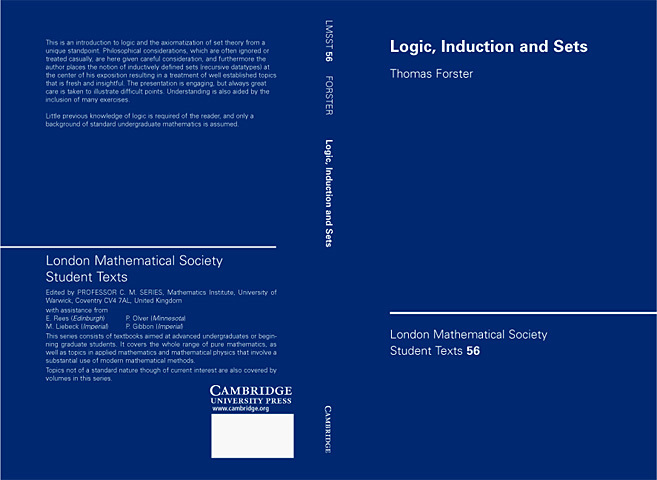 This book was written to the specifications of the syllabus committee for the third year course in Logic given in the Mathematics Faculty at Cambridge, and is based on the lecture notes from which I lectured it. (The syllabus has now changed). The book starts off with background in discrete maths, then has chapters on recursive datatypes, boolean logic, lattices and fixed-point-theorems, predicate logic, computable functions, ordinals and sets. There are exercises sprinkled throughout the text, and it ends with a chapter of worked answers to a selection of them. Despite this, it is not really recommended for self-study, but rather as an adjunct for people who are attending a course of lectures in undergraduate logic, since it grew also out of my supervision notes for this course. In fact it ideally complements Peter Johnstone's ``Notes on Set theory and Logic''. To order it visit CUP (New York) (if you happen to be in the US) or CUP (Cambridge) if you are in the United Kingdom. If you are in Australia or lucky enough to be in New Zealand go to CUP in Melbourne . Paperback and hardback both available.